Mary (33) and Elizabeth Davide (6) in action during a game. Both sisters play for the Butler lacrosse team. Jimmy Lafakis/Collegian file photo. It took about a second. Not even that. 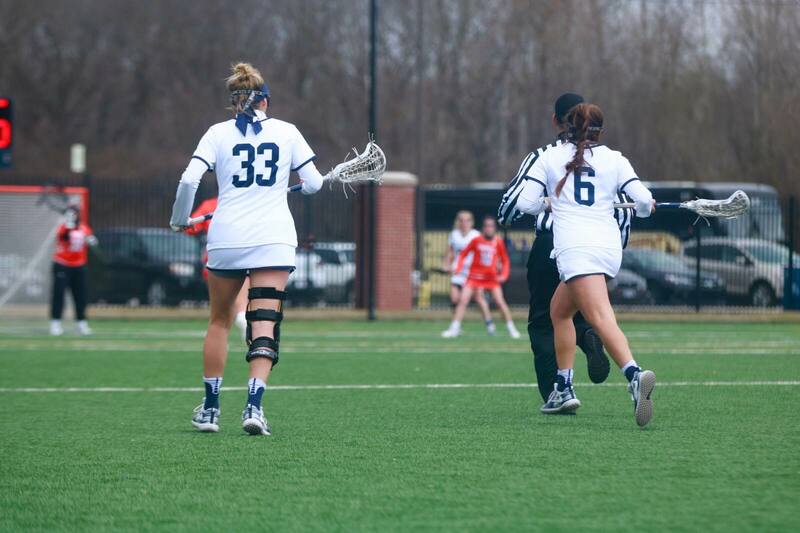 Butler lacrosse sophomore Elizabeth Davide didn’t even get to finish her sentence before she was interrupted. Junior Mary Davide, Elizabeth’s sister and teammate, couldn’t hold her tongue any longer. “No, I beat you,” Mary said, emphasizing every word, as if the sentence bursted out of her. The concurrent sentences gave way to a piercing silence. It was only about a second, but it felt like the seven minutes and three seconds it allegedly took Mary to run the mile at the lacrosse team’s fall run test. The two looked at each other, then both shot a glance to their coach before making eye contact once more. Head coach Cecil Pilson caught their glance before returning to his laptop screen. Something was going to have to give. Fraught with the tension, it was Elizabeth who finally back-pedaled. “Well, OK, fine,” she said. It seemed as if it was over, but then it wasn’t. “But then in the spring, I beat you. I beat you one time,” Elizabeth said. There was no silence this time. “No, you didn’t,” Mary said. Elizabeth had to get the last word in. Coach Pilson looked it up in his records, and she was right. The takeaway from all this isn’t who beat who in which run test. It’s that they care that much about it — a glorified practice that happened a year and a half ago. Despite how it may have come off, the rivalry is friendly at heart. For the Davide sisters, it’s all about bettering each other. Before the run tests, the two had talked out their goals and went at it together. Mary said it wasn’t until the final seconds of the run that the competition kicked into gear. Obviously, this made them run those final seconds faster. “I think if we went to different school a run test or just like that part would just be harder because then I wouldn’t have her by my side,” Elizabeth said. As far as stats go, it is more difficult to compare because of a difference in position. Mary is a defenseman while Elizabeth is a midfielder. Mary has appeared in 26 of the team’s 27 games since making her debut in 2018. Last season, she tied for the team lead in ground balls with 29. Elizabeth has also played in 26 games in her Butler career, scoring five goals and finishing second on the team in draw controls in 2018. When Elizabeth arrived at Butler as a freshman, Mary was a sophomore and helped her self-diagnosed “directionally-challenged” sister navigate campus and provided support. Mary being at Butler was a large factor in Elizabeth’s decision to come to the university. After her plans to play at Notre Dame fell through, she said Butler was a natural fit because Mary was there and liked it so much already. While it was Mary who paved the path at Butler, Elizabeth actually started playing lacrosse first. After attending a camp in eighth grade, Elizabeth had to teach her sister the basics when she quickly wanted to pick up the sport. It’s been a common theme for them. Elizabeth started playing lacrosse and Mary soon followed. Mary came to Butler and Elizabeth soon followed. Elizabeth crossed the finish line in the fall run test and, three seconds later, Mary followed. When they aren’t side by side, like when Elizabeth got injured, it changes everything. Both agree that the most helpful thing about having a sister as a teammate is the bluntness. While other teammates may try to sugarcoat things, they give it to each other straight and it allows them to easily pinpoint what they need to work on. As the Butler lacrosse team leaves the locker room onto their field, they see a sign that reads “It’s not personal; it’s lacrosse.” As Pilson pointed out, for them it’s not personal, it’s their sister.